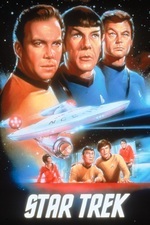 An experimental M-5 computer is installed in the Enterprise which has been ordered to test it with a skeleton crew, but when the computer takes over and wreaks havoc on the Federation fleet, the crew must find a way to disable the device. "The Ultimate Computer" was first broadcast on March 8, 1968 and repeated June 28, 1968. It is episode No. 53, production No. 53, written by D.C. Fontana, based on a story by Laurence N. Wolf, and directed by John Meredyth Lucas. In this episode, a skeleton Enterprise crew are assigned to test a revolutionary computer system that is given total control of the ship. The episode can be viewed on Netflix. Comments from the original cast. Benway, you put these nice posts together on TOS and they don't get the comments you or the show deserve. Come on, Trekkies! Get arguing about Jeffries tubes and how many toilets were on the Enterprise! You know you wanna! On the TNG-era shows there was a Daystrom Institute that came up sometimes, usually in reference to robotics scientists who wanted to study Data. It always seemed kind of funny to me that Daystrom got a whole institute in his honor, given the showing he puts in here. I can never see William Marshall as anybody but Blackula. (I loved Blackula when I was a kid, thanks to Elvira.) Here he's Blackula as a famous scientist, on Pee-Wee's Playhouse he was Blackula as the King of Cartoons. Marshall was always such an elegant, distinguished presence, and it's sad in some ways that he's best known as Blackula, Daystrom and the King of Cartoons. But hey, on the other hand, Blackula, Daystrom and the King of Cartoons! This episode at least explained why humans were necessary on any of the starships. Not that "computers go crazy sometimes" is a great explanation but outside of that there isn't really any good reason why they all couldn't just be on auto-pilot. Great on Star Trek for casting a black actor as a distinguished computer scientist. I had no idea. This is an even bigger revelation to me than Laurence Fishburne as Cowboy Curtis. Benway, you put these nice posts together on TOS and they don't get the comments you or the show deserve. I don't know why I can't seem to come up with much to say each week - but, Benway, I really, really appreciate that you keep making these posts, I am on this rewatch till the end. I've never seen Blacula, and saw barely any of Pee-Wee's Playhouse, so this is probably the only impression I have of him. I had the feeling watching him that he must have done a lot of theater, which the Memory Alpha bio confirms. He must have been amazing on-stage, he seems like he'd be one of those actors who just commands attention the second he appears. He played De Lawd in the stage production of The Green Pastures, but unfortunately, not in the film version . I'd pay money to've seen him in that. he was Blackula . . . and the King of Cartoons . . . I had no idea. Wait until Blues Brothers movie fans get to see "The Way to Eden". N' wear a ten-gallon hat with th' Good Ol' Boys! How 1960s media doesn't meet today's standards of whatever. The Much Later Generation, Star Wars on Star Trek 9, Lost in Quadrants, and Quantum Enterprise. Hmm, well, Percy Rodriguez played Kirks's superior and judge in the first season ep, "Court Martial". (And Kirk's defence counsel was Wilmer the Gunsel from The Maltese Falcon.) Not as chewy a role of course, but in both cases, a high-status character who "happens to be black". By "both cases", I meant Daystrom and Stone, of course, not Cogley. Dude. Not all of us feel like Trek ended with TOS. Many of us love TOS and love the Trek shows that followed it. What's wrong with pointing out fun TOS references and connections in the later shows? If you want the conversation to be about something else, start a new conversation! Harrumph! He brings real gravitas to the role, which is pretty amazing. I mean, it's Blacula! It's a cheesy 1970s Blacksploitation movie, but he manages to be regal and cool and sad and frightening. He's much, much better in the role than he needs to be. Agreed. And "how 1960s media doesn't meet today's standards of whatever"? I'm happy to give the show credit for doing its share of groundbreaking, but I see no reason to be silent when I feel disappointed by something the writers chose to do. It would be one thing if the show was set up to be pure escapism, but Roddenberry was idealistic and progressive about some things, so I don't think there's anything wrong with pointing out where he fell short of his ideals. What's wrong with pointing out . . . I don't think there's anything wrong with pointing out . . .
Nobody said it was wrong; and I do know how mefites love to point things out. I share your disappointment with Star Trek threads on Fanfare. I replied -- to your complaint about low participation on Star Trek threads -- that I would have more to say if the conversation were more focussed on the episode at hand. That is all. It was only one of several points I made in my last post, and the only 'meta' one, yet it was the only one that engaged you. So as far as having an interesting conversation about jeffries tubes, toilet facilities, and so on, there is that to consider. yet it was the only one that engaged you. I think he meant me. In any case I think this is getting needlessly contentious. Trekkie should not fight Trekkie! IDIC!